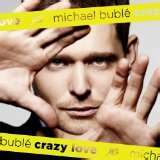 Michael Buble has sold 22,000,000 albums (so far) worldwide. His singing voice is impeccable. His songs capture romance, heartache, love and every other emotion that goes along with any relationship you’ve ever been in. His song “Everything” is a very popular first-dance song at weddings. And his live performances are unreal. No wonder he’s got millions of fans worldwide chomping at the bit, anticipating the release of his third album “Crazy Love”. The album was initially supposed to be released on October 13, but due to fan demand the album will now be released 4 days prior (October 9). You can pre-order it now. I had the priveledge of being the very first radio personality in the USA to speak to Michael Buble as he begins his mass promo for his new album. An even bigger honor was having him serenade me…I still have the goosebumps!